This was the best-selling Mark series Lincoln at more than 228,000 units and was the longest two-door coupe ever sold by Ford at 230 inches long. Think modern day Chevy Suburban in length. Now Automodello creates three fine Diamond Jubilee editions of the Mark V, fresh on the heels of its stellar Mark III editions, all in modelers’ favorite, 1/24 scale. 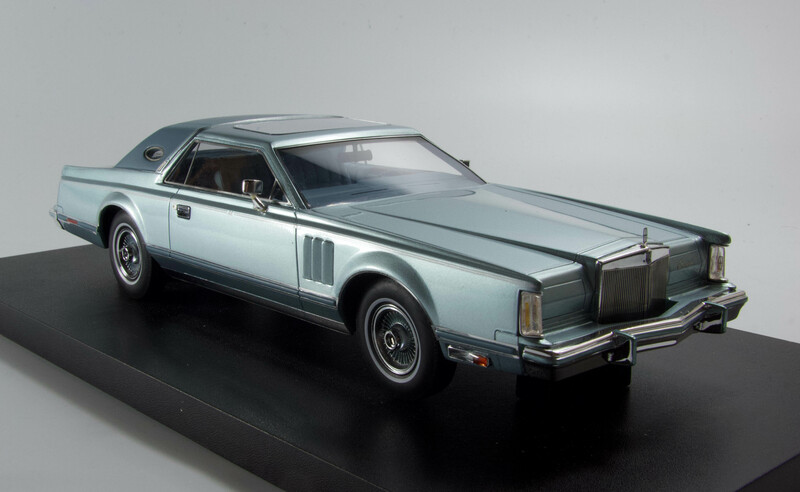 Lincoln’s Mark V was an update of the Mark IV, but with a new interior and major changes to the exterior too. It was made for the 1977-79 model years. The cars were made in Ford’s Wixom (Mich.) assembly plant. A new 400-cid, 6.6-liter V8 powered the car, with a 460-cid V8 as an option. And, as fuel economy was an issue in the 1970s, Ford’s engineers trimmed 400 lbs. of weight from the Mark V compared with its predecessor. The car also featured a nearly flat roof and long straight fenders to give the car a slim profile, despite its size. 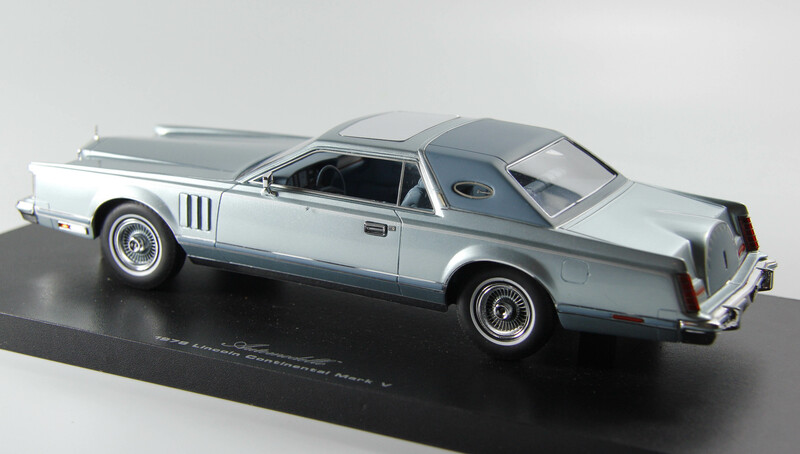 For 1978 a Diamond Jubilee Edition was introduced, commemorating Ford’s 75th anniversary. That’s the model Automodello has replicated here. The special package (including the first Ford clearcoat paint ever) added $8,000 to the car’s price tag, making it the most expensive Ford car ever, at the time at more than $21,000. Yet more than 5,000 Diamond Jubilee editions were sold. Automodello is making 175 each of the Diamond Jubilee Edition Mark Vs in the two original colors, Diamond Blue and Jubilee Gold. They retail at $249.95 each, while a very limited (24) Homage Edition version in black with tan interior will be made, retailing at $449.95. All are sharp looking. We saw the gold model at a recent model car show and it’s flashy, to put it mildly. 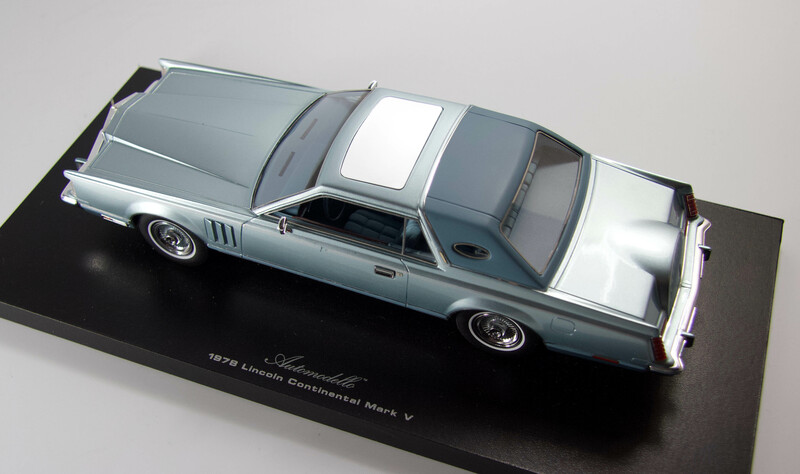 We snagged the blue version to review and the depth of its silvery blue metallic paint scheme is gorgeous, while it also features a vinyl look top that basically matches the car’s blue-gray interior. Cool too that the oval opera windows add interest to that vinyl section of the roof and small Lincoln Motor Car logos grace those tiny windows. Dimensions and body shapes are all beautifully sculpted here with that fake spare tire bulge in the trunk lid being executed to perfection. This is a throwback to the old Continental Kits so many 1950s cars touted to match the elegance of the original Continentals. At the front of that long, sculpted Lincoln hood is a photo-etched hood ornament atop the large, but beautiful waterfall grille. The 5-mph bumpers that extend front and rear are surrounded by sharp chrome bumpers and there are chrome mirrors on both doors plus well-defined chrome pull-up door handles. Headlights are fold-away style and are posed closed, with Continental script on the right headlight cover. Running lights mounted in the tall front fenders look realistic as do the tall red taillights with delicate silver horizontal trim lines. Wheels are chrome and the tires white-sidewalls, both beautifully reproduced. There’s no branding on the treaded white-sidewall tires. This is a sealed body car and the passenger’s side windows are posed in the up position. That leaves the driver’s side window down for peering into the pretty blue-gray leather interior with its plush pillowed seats and fake wood trim (like the 1/1 car) atop the doors, on the console, dash and two-spoke steering wheel’s hub. Dash gauges are obviously decals, but quite detailed and easy to see and identify. One final detail gives the car an added boost of realism and luxury 1970s style, a reflective sunroof with a mirrored finish. 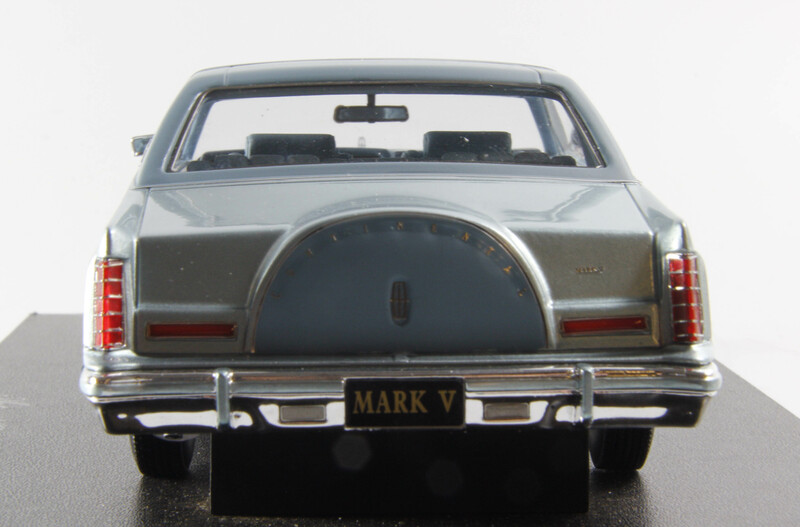 The Mark V exudes luxury and class that is now a long-lost memory it seems.